Many thanks to Chris Rolfe and Jerry Anderson for giving permission for this incident to be covered by The WHY? Files. The following is a précised version the article “The Burmarsh UFO Incident” by Stuart Miller of UFO Review. Many thanks to Stuart! “The Burmarsh Incident” is one of the most fascinating cases in UK Ufology, it involves virtually all of the aspects of a “classic” UFO account. A young lady driving along a country road late at night, a large triangular craft hovering over a village, anonymous phone calls, official denials, M.I.B., threats and phone tapping. 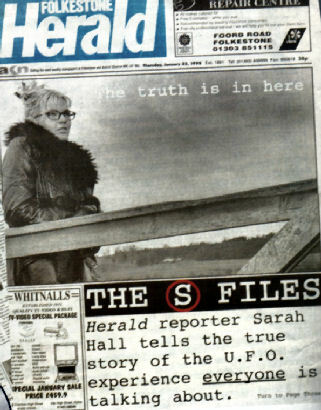 Very early on the morning of 8th March, 1997, Sarah Hall, a journalist with the Folkestone Herald, was driving home when her attention was caught by a large triangular object hovering over the village of Burmarsh in Kent (U.K.). As Sarah stopped her car the object “literally shot off”. “It stopped again, sort of another 500 yards away from me and it did that four times. It just shot further and further away but stopped four times, sort of moved for about five or six seconds, stopped for two seconds, then moved again for another ifve or six seconds and so on”. Sarah Hall's sketch of the triangular craft she observed hovering over Burmarsh. Two days later Sarah rang Chris Rolfe at “UFO Monitors East Kent” to report her sighting, adding that the object displayed white and yellow lights around its edge and a circle of light in the middle. There was a bright white light at each corner. Sarah also wrote an article describing her experiences which was duly published in the Folkestone Herald newspaper. However, she was somewhat surprised to discover that the published version of her story contained a number of differences to her original article. These “amendments” included a change of location giving the impression that the incident she witnessed had, in fact, occurred several miles away from the actual location, which, coincidentally, was the home of senior politician Michael Howard. In fact, being new to the area, Sarah had simply got the place names wrong and there had been no “sinister interference” at this stage. Further allegations that Michael Howard’s political agent had complained about the article were also to be proved false. The original article as it appeared in the Folkestone Herald. Chris Rolfe quickly discovered that Sarah Hall had seemingly not been the only witness to the craft hovering over the Kent countryside that night. He became aware that two local firemen had also seen the triangular craft and rumour spread of a fire appliance being called out to Michael Howard’s house coincidental to Sarah’s sighting. Kent Fire services however would not verify this. The reputed sighting by the two firemen was the first instance that Michael Howard’s home was mentioned apart from the original published article and even then it was not Sarah who referred to the politician’s home but an anonymous phone call was received by the Folkestone Herald – the caller stated that the two firemen had seen the triangular craft over Michael Howard’s house. This anonymous call was made five days after Sarah’s sighting. There were, in fact, another eight eye-witness sightings which came to the attention of Chris Rolfe. As he was unable to verify them, Chris did not initially reveal these additional reports which he received from a gentleman at an adjoining UFO group who died before Chris could discuss the situation with him. These unconfirmed reports which were coincidental to Sarah’s included sightings at Lydd, Burmarsh, Newchurch, Ashford, Smeeth and Aldington – they all occurred between 02:10 a.m. and 03:30 a.m. on the morning of 8th March, 1997. Chris Rolfe and Jerry Anderson decided to write to various agencies in an effort to clarify just what had happened in the skies over Kent. Initially, after submitting a report, they contacted the Kent Constabulary requesting any information relating to the Burmarsh incident. 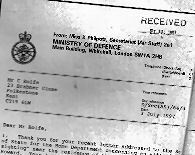 Chief Inspector Mike Abbott of Kent Police referred the request for information to RAF Biggin Hill who, in turn, forwarded it on to the Ministry of Defence. On July 3rd, Chris received a letter from Kerry Philpott (Head of Secretariat Air Staff 2al) confirming that she had received Chris’ correspondence etc. and also from the Home Office as Chris had also contacted them. The M.O.D. did, in fact, deny that any events took place. (Strangely, on June 30th, a freelance reporter contacted the M.O.D. enquiring about the Burmarsh Incident and the M.O.D. denied any knowledge despite the fact that they were in possession of Chris Rolfe’s documentation). The letter from Miss K. Philpot (M.O.D.) denying any incident had occurred. The M.O.D. 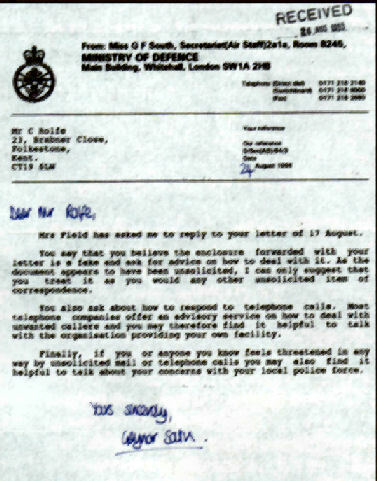 'S response to the request for advice and information regarding threats etc..
Letter from Wing Commander A.W.Ward. 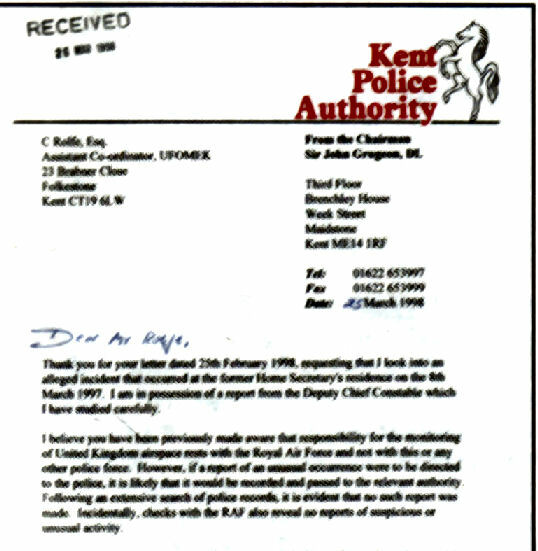 In the meantime Sir John Grudgeon, Chairman of the Kent Police Authority, did reply to a letter from Chris stating that he had received a letter from the Deputy Chief Constable of Kent reporting that a “minor security” incident had taken place. The incident did not involve an “aeroplane”. The letter from the police confirming that an incident did occur but that it did not involve aircraft or vehicles. Euro M.P. Mark Watts did try unsuccessfully to obtain further information relating to the Burmarsh incident and a year was almost to pass before the next major chapter in this story was to take place. Jerry Anderson went to Waterstones book shop in Canterbury where Tim Good was giving a talk about his new book. 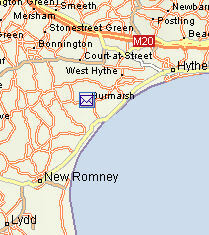 Afterwards a man approached Jerry enquiring if he had investigated the Burmarsh Incident. The man went on to explain that he was a neighbour of Michael Howard’s and that he and his wife had been awoken in the early hours of 8th March 1997 by a commotion coming from the politician’s house. He described how there were a lot of people running round and shouting and that they were under the impression that armed police guards were present. All of this was accompanied by a helicopter hovering overhead and a searchlight scanning the area. This searchlight, however, was not scanning the ground but was pointing upwards scanning the skies. 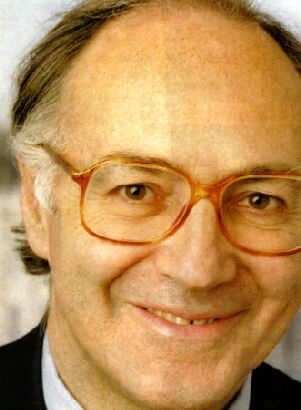 Michael Howard, senior politician and future leader of the Conservative Party - did a UFO hover over his house? Quite definitely not according to Mr. Howard. Threats, Hacking and Phone Taps! 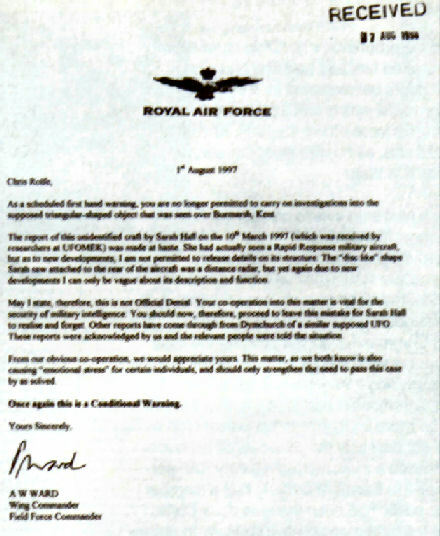 On 17th August 1998, Chris received a letter from a certain Wing Commander A.W.Ward of the R.A.F. 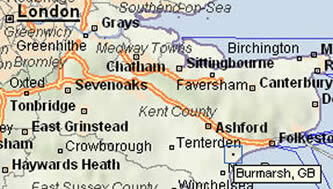 which included a warning to stop his investigations into a triangular shaped object over Burmarsh, Kent. The letter was typed on RAF headed papr and was signed but the existence of the “Wing Commander” has never been confirmed. 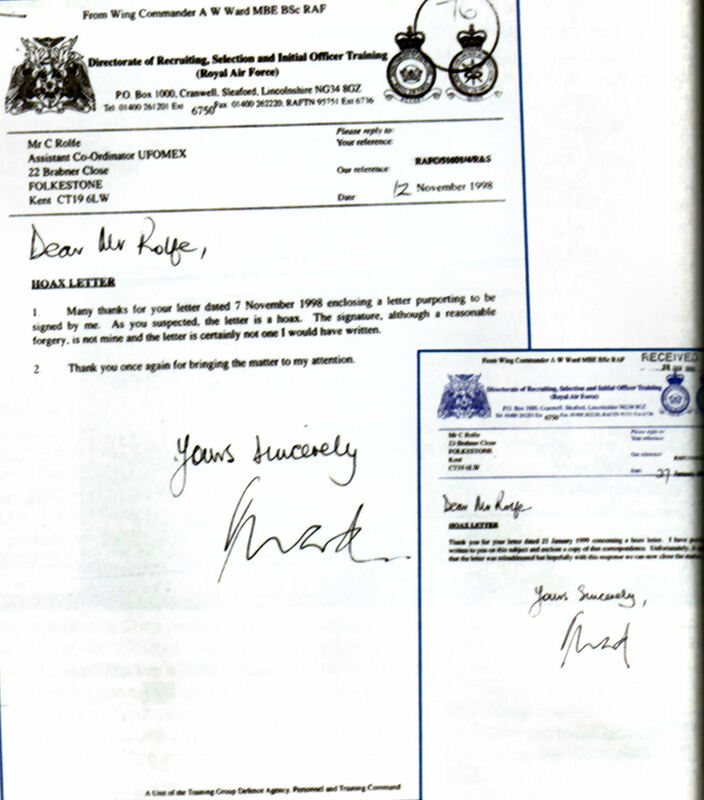 Chris wrote to Mrs. Mollie Field, Head of Secretariat Air Staff 2, enclosing a copy of the letter and stating that it was obviously a forgery and the culprit should be traced and punished. Mrs. Field suggested that the letter should be treated as unsolicited mail and perhaps he should call the police. By chance Chris did, in fact, come across a copy of the Royal Air Force List (1991) which is a register of every serving officer and, sure enough, the name A.W. Ward was included – but as a Squadron Leader in 1991. Chris did manage to discover that Wing Commander Ward was indeed serving in the RAF when confronted with letter he denied sending it although he admitted that the signature was a very good forgery. Fellow investigator Jerry Anderson was to discover that someone was trying to access his pin number which he uses to remotely check his BT answering machine. There were in excess of twenty attempts to access his answering machine and this was accompanied by his wife answering the door to a man who was asking for Mr. J.B. Anderson. The only documents that bear his full initials are his banking and driving licence documents. The mn claimed to be from the television licence authority and left in a small white van. The TV Licensing Authority denied any knowledge of such a man. On 9th February 1999, Jerry received a large manila envelope through the post which contained a white cassette tape. On this tape there was a recording of a telephone conversation between Chris and himself from over a year previously. The conversation was 20 minutes in duration and was a discussion about the Burmarsh Incident. Two days later Chris also received a copy of the tape. BT investigated the situation but could find no evidence of phone tapping and Jerry called in a local investigator who noticed that Jerry’s line was losing voltage. The investigator concluded that the tap had been carried out remotely using a laser directional microphone. This conclusion was based on technical evidence gathered from the tape itself. Sarah Hill also received a copy of the tape. In July 1998, two young girls in Margate ran into their homes to tell their parents that they had just seen a strange object in the sky. An hour later the same object was seen by the father of one of the girls. He reported to the “Thanet Times” that the object was either escorted or chased by two other aeroplanes, he was unsure. Details of the object were very similar to the craft seen in he skies over Burmarsh and reporter Emma Batt went to the addresses of the girls to investigate. The girls did, in fact, live next door to each other but on arrival Emma was informed that both families had been “gone” for some time. No one knew where.